In Search of Aqua Darlings. The majestic Aqua Follies at Green Lake. Aquatic-themed cabarets are my current summer research obsession- in particular, Green Lake’s Aqua Follies here in Seattle. 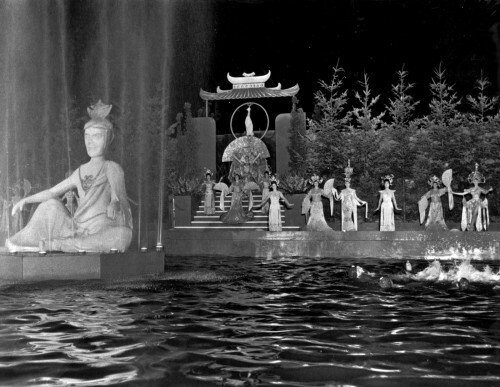 In a typically grand but poorly executed Seattle plan, the Aqua Theatre was built in 1950 to host water ballet “swimusicals” for the first Seafair. 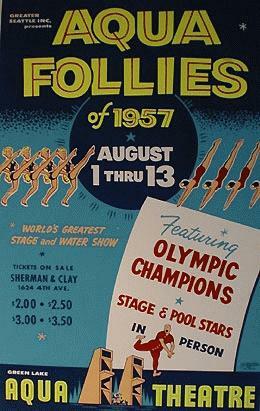 A floating orchestra pit and synchronized swimmers (cleverly called the Aqua Darlings) were star attractions for summer productions. These ran until 1964, the theater itself lurching along until it was dismantled in 1970 (just after Led Zeppelin and the Grateful Dead played there). Parts of the original structure and grandstand remain along Green Lake to this day, barely hinting at the short-lived but spectacular past of the Aqua Theatre and its glamourous Aqua Darlings. While I desperately try to locate former Aqua Darlings that might still be around, you can read more about the sadly forgotten Aqua Theatre HERE. 1957 Poster taken from historylink,org, courtesy of Peter Blecha. ~ by angrytruffle on 08/09/2011. Love this Jessica! More history, more history! I was an Aqua Darling that first year in Seattle. I will never forget how cold the water was.